The Catholic Church and the Old Catholic Church recognise seven sacraments: Baptism, Reconciliation (Penance or Confession), Eucharist (or Holy Communion), Confirmation, Marriage (Matrimony), Holy Orders, and Anointing of the Sick (Extreme Unction). The Eastern Orthodox Church and Oriental Orthodox Church also believe that there are seven major sacraments, but apply the corresponding Greek word, μυστήριον (mysterion) also to rites that in the Western tradition are called sacramentals and to other realities, such as the Church itself. Many Protestant denominations, such as those within the Reformed tradition, identify two sacraments instituted by Christ, the Eucharist (or Holy Communion) and Baptism. The Lutheran sacraments include these two, often adding Confession (and Absolution) as a third sacrament. Anglican and Methodist teaching is that "there are two Sacraments ordained of Christ our Lord in the Gospel, that is to say, Baptism and the Supper of the Lord," and that "those five commonly called Sacraments, that is to say, Confirmation, Penance, Orders, Matrimony, and Extreme Unction, are not to be counted for Sacraments of the Gospel." Some traditions do not observe any of the rites, or hold that they are simply reminders or commendable practices that do not impart actual grace—not sacraments but "ordinances" pertaining to certain aspects of the Christian faith. The English word "sacrament" is derived indirectly from the Ecclesiastical Latin sacrāmentum, from Latin sacrō ("hallow, consecrate"), from sacer ("sacred, holy"). This in turn is derived from the Greek New Testament word "mysterion". In Ancient Rome, the term meant a soldier's oath of allegiance. Tertullian, a 3rd-century Christian writer, suggested that just as the soldier's oath was a sign of the beginning of a new life, so too was initiation into the Christian community through baptism and Eucharist. During the Middle Ages, sacraments were recorded in Latin. Even after the Reformation, many ecclesiastical leaders continued using this practice into the 20th century. On occasion, Protestant ministers followed the same practice. Since W was not part of the Latin alphabet, scribes only used it when dealing with names or places. In addition, names were modified to fit a "Latin mold". For instance, the name Joseph would be rendered as Iosephus or Josephus. The Catholic Church indicates that the sacraments are necessary for salvation, though not every sacrament is necessary for every individual. The Church applies this teaching even to the sacrament of baptism, the gateway to the other sacraments. It states that "Baptism is necessary for salvation for those to whom the Gospel has been proclaimed and who have had the possibility of asking for this sacrament." But it adds: "God has bound salvation to the sacrament of Baptism, but he himself is not bound by his sacraments," and accordingly, "since Christ died for the salvation of all, those can be saved without Baptism who die for the faith (Baptism of blood). Catechumens and all those who, even without knowing Christ and the Church, still (under the impulse of grace) sincerely seek God and strive to do his will can also be saved without Baptism (Baptism of desire). The Church in her liturgy entrusts children who die without Baptism to the mercy of God." The Eastern Orthodox tradition does not limit the number of sacraments to seven, holding that anything the Church does as Church is in some sense sacramental. However it recognizes these seven as "the major sacraments", which are completed by many other blessings and special services. Some lists of the sacraments taken from the Church Fathers include the consecration of a church, monastic tonsure, and the burial of the dead. More specifically, for the Eastern Orthodox the term "sacrament" is a term which seeks to classify something that may, according to Orthodox thought, be impossible to classify. The Orthodox communion's preferred term is "Sacred Mystery", and the Orthodox communion has refrained from attempting to determine absolutely the exact form, number and effect of the sacraments, accepting simply that these elements are unknowable to all except God. According to Orthodox thinking God touches mankind through material means such as water, wine, bread, oil, incense, candles, altars, icons, etc. How God does this is a mystery. On a broad level, the mysteries are an affirmation of the goodness of created matter, and are an emphatic declaration of what that matter was originally created to be. The seven sacraments are also accepted by Oriental Orthodoxy, including the Coptic Orthodox Church, Ethiopian Orthodox Tewahedo Church, and the Armenian Orthodox Church. Anglican and Methodist sacramental theology reflects its dual roots in the Catholic tradition and the Protestant Reformation. The Catholic heritage is perhaps most strongly asserted in the importance Anglicanism and Methodism places on the sacraments as a means of grace and sanctification, while the Reformed tradition has contributed a marked insistence on "lively faith" and "worthy reception". Anglican and Roman Catholic theologians participating in an Anglican/Roman Catholic Joint Preparatory Commission declared that they had "reached substantial agreement on the doctrine of the Eucharist". Similarly, Methodist/Roman Catholic Dialogue has affirmed that "Methodists and Catholics affirm the real presence of Christ in the Eucharist. This reality does not depend on the experience of the communicant, although it is only by faith that we become aware of Christ's presence." The Catholic Church and the World Methodist Council jointly understand the word "sacrament" as referring not only to the sacraments considered here, but also to Christ and the Church. Article XXV of the Thirty-Nine Articles in Anglicanism and Article XVI of the Articles of Religion in Methodism recognises only two sacraments (Baptism and the Supper of the Lord) since these are the only ones ordained by Christ in the Gospel. The article continues stating that "Those five commonly called Sacraments ... are not to be counted for Sacraments of the Gospel ... but have not the like nature of Sacraments with Baptism and the Lord's Supper, for they have not any visible sign or ceremony ordained by God." These phrases have led to a debate as to whether the five are to be called sacraments or not. A recent author writes that the Anglican Church gives "sacramental value to the other five recognised by the Roman Catholic and Orthodox Churches" but these "do not reveal those essential aspects of redemption to which Baptism and Communion point". Some Anglicans maintain that the use of "commonly" implies that the others can legitimately be called sacraments (perhaps more exactly "Sacraments of the Church" as opposed to "Sacraments of the Gospel"); others object that at the time the Articles were written "commonly" meant "inaccurately" and point out that the Prayer Book refers to the creeds "commonly called the Apostles' Creed" and the "Athanasian" where both attributions are historically incorrect. Anglicans are also divided as to the effects of the sacraments. Some hold views similar to the Roman Catholic ex opere operato theory, that is that when the outward ceremony is duly performed the inward grace is necessarily given unless the recipient puts some obstacle in the way (non ponere obicem). Article XXVI (entitled Of the unworthiness of ministers which hinders not the effect of the Sacrament) states that the "ministration of the Word and Sacraments" is not done in the name of the minister, "neither is the effect of Christ's ordinance taken away by their wickedness," since the sacraments have their effect "because of Christ's intention and promise, although they be ministered by evil men". As in Roman Catholic theology, the worthiness or unworthiness of the recipient is of great importance. Article XXV in the Thirty-Nine Articles of Anglicanism and Article XVI in the Articles of Religion in Methodism states: "And in such only as worthily receive the [sacraments], they have a wholesome effect and operation: but they that receive them unworthily purchase to themselves damnation," and Article XXVIII in Anglicanism's Thirty-Nine Articles (Article XVIII in Methodism's Articles of Religion) on the Lord's Supper affirms "to such as rightly, worthily, and with faith, receive the same, the Bread which we break is a partaking of the Body of Christ". In the Exhortations of the Prayer Book rite, the worthy communicant is bidden to "prepare himself by examination of conscience, repentance and amendment of life and above all to ensure that he is in love and charity with his neighbours" and those who are not "are warned to withdraw". The Westminster Confession of Faith also limits the sacraments to baptism and the Lord's Supper. Sacraments are denoted "signs and seals of the covenant of grace". Westminster speaks of "a sacramental relation, or a sacramental union, between the sign and the thing signified; whence it comes to pass that the names and effects of the one are attributed to the other". Baptism is for infant children of believers as well as believers, as it is for all the Reformed except Baptists and some Congregationalists. Baptism admits the baptized into the visible church, and in it all the benefits of Christ are offered to the baptized. On the Lord's supper, Westminster takes a position between Lutheran sacramental union and Zwinglian memorialism: "the Lord's supper really and indeed, yet not carnally and corporally, but spiritually, receive and feed upon Christ crucified, and all benefits of his death: the body and blood of Christ being then not corporally or carnally in, with, or under the bread and wine; yet, as really, but spiritually, present to the faith of believers in that ordinance as the elements themselves are to their outward senses." For other uses, see Sacrament (LDS Church), Sacrament (Community of Christ), and Ordinance (Latter Day Saints). Members of the Latter Day Saint movement often use the word "ordinance" in the place of the word "sacrament", but the actual theology is sacramental in nature. Latter-Day Saint ordinances are understood as conferring an invisible form of grace of a saving nature and are required for salvation and exaltation. Latter-Day Saints often use the word "sacrament" to refer specifically to the Sacrament of the Lord's Supper, also known as the Lord's Supper, in which participants eat bread and drink wine (or water, since the late 1800s) as tokens of the flesh and blood of Christ . In Latter Day Saint congregations, the sacrament is normally provided every Sunday as part of the sacrament meeting and, like other Latter-Day Saint ordinances such as baptism and confirmation, is considered an essential and sacred rite. 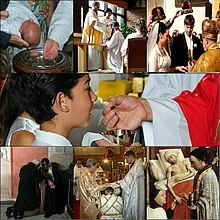 Latter-Day Saint ordinances which are considered "saving" include Baptism, Confirmation, Sacrament of the Lord's Supper (Eucharist), Ordination (for males), Initiatory (called Chrismation in other Christian Traditions) and Endowment, and Marriage . In the Community of Christ, eight sacraments are recognized, including "baptism, confirmation, blessing of children, the Lord's Supper, ordination, marriage, the Evangelist Blessing, and administration to the sick". In addition to the traditional seven sacraments, other rituals have been considered sacraments by some Christian traditions. In particular, foot washing as seen in Anabaptist, Schwarzenau Brethren, German Baptist groups or True Jesus Church, and the hearing of the Gospel, as understood by a few Christian groups (such as the Polish National Catholic Church of America), have been considered sacraments by some churches. The Assyrian Church of the East holds the Holy Leaven and the sign of the cross as sacraments. 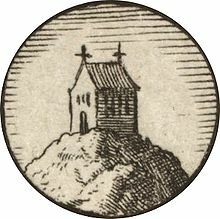 The Clancularii were an Anabaptist group in the 16th century who reasoned that because religion was seated in the heart, there was no need of any outward expression through the sacraments. ^ Lutheran Forum, Volumes 38-39. 2004. p. 46. A sacrament is an outward sign of an inward grace. ^ Lyden, John C.; Mazur, Eric Michael (27 March 2015). The Routledge Companion to Religion and Popular Culture. Routledge. p. 180. ISBN 9781317531067. Augustine defines a sacrament as "an outward sign of an inward grace". Reformed tradition subscribes to this definition (see McKim 2001: 135). ^ Melton, J. Gordon; Baumann, Martin (21 September 2010). Religions of the World: A Comprehensive Encyclopedia of Beliefs and Practices, 2nd Edition. ABC-CLIO. p. 2137. ISBN 9781598842043. The Old Catholic Church accepts seven sacraments, the intermediaries of salvation. ^ Sacramental Rites in the Coptic Orthodox Church. Copticchurch.net. 4 August 2016. ^ a b Haffner, Paul (1999). The Sacramental Mystery. Gracewing Publishing. p. 11. ISBN 9780852444764. The Augsburg Confession drawn up by Melanchton, one of Luther's disciples admitted only three sacraments, Baptist, the Lord's Supper and Penance. Melanchton left the way open for the other five sacred signs to be considered as "secondary sacraments". However, Zwingli, Calvin and most of the later Reformed tradition accepted only Baptism and the Lord's Supper as sacraments, but in a highly symbolic sense. ^ Smith, Preserved (1911). The Life and Letters of Martin Luther. Houghton Mifflin. p. 89. In the first place I deny that the sacraments are seven in number, and assert that there are only three, baptism, penance, and the Lord's Supper, and that all these three have been bound by the Roman Curia in a miserable captivity and that the Church has been deprived of all her freedom. ^ Roo, William A. van (1992). The Christian Sacrament. Roma: Ed. Pontificia Univ. Gregoriana. p. 37. ISBN 978-8876526527. ^ Minert, Roger (2013). Deciphering Handwriting in German Documents: Analyzing German, Latin, and French in Historical Manuscripts. Provo: GRT Publications. pp. 79–84. ^ Yrigoyen Jr., Charles (25 September 2014). T&T Clark Companion to Methodism. T&T Clark. p. 259. ISBN 9780567290779. 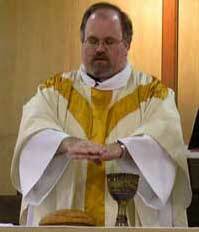 Baptism and eucharist are 'not only badges or tokens of Christian men's profession,' (Anglican and Methodist). ... They are that, but they are also 'certain sure witnesses and effectual signs of grace' (Anglican), or 'certain signs of grace and of God's good will toward us' (Methodist) ... Thereby, they not only 'quicken but also strengthen and confirm our faith.' ... they are 'means of grace,' a point agreed on in other sources by both Anglicans and Methodists. Sacraments are thus seen as being 'from above' That is, they are divine acts directed toward humanity as a way of ultimately sanctifying us. ^ "Synthesis, Together to Holiness: 40 Years of Methodist and Roman Catholic Dialogue" (PDF). World Methodist Council. 2010. p. 23. Retrieved 15 May 2016. ^ "The Grace Given You in Christ: Catholics and Methodists Reflect Further on the Church (The Seoul Report), Report of the Joint Commission for Dialogue Between the Roman Catholic Church and the World Methodist Council". 2006. Retrieved 15 May 2016. The idea of a sacrament is ideally suited to holding together internal and external, visible and spiritual, and both Catholics and Methodists have begun to speak of the Church itself in a sacramental way. Christ himself is "the primary sacrament", and, as the company of those who have been incorporated into Christ and nourished by the life-giving Holy Spirit, "the Church may analogously be thought of in a sacramental way." United Methodists and Catholics both proclaim that the church itself is sacramental, because it effects and signifies the presence of Christ in the world of today. ^ Seddon, Philip (1996). "Word and Sacrament". In Bunting, Ian (ed.). Celebrating the Anglican Way. London: Hodder and Stoughton. p. 101. ^ a b Seddon, Philip (1996). "Word and Sacrament". In Bunting, Ian (ed.). Celebrating the Anglican Way. London: Hodder and Stoughton. p. 100. ^ Bates, Hugh (1990). "The Worthy Communicant". In Johnson, Margot (ed.). Thomas Cranmer. Durham (UK): Turnstone Ventures. pp. 106f. ^ Matthew 28:19, 1 Corinthians 11:23-25, Matthew 26:26-28, Mark 14:22-24, Luke 22:19-20, Graebner, Augustus Lawrence (1910). Outlines Of Doctrinal Theology. Saint Louis, MO: Concordia Publishing House. p. 161. Archived from the original on 21 January 2012. ^ Ephesians 5:27, John 3:5, John 3:23, 1 Corinthians 10:16, Graebner, Augustus Lawrence (1910). Outlines Of Doctrinal Theology. Saint Louis, MO: Concordia Publishing House. p. 162. Archived from the original on 21 January 2012. ^ Ephesians 5:26, 1 Corinthians 10:16, 1 Corinthians 11:24-25, Graebner, Augustus Lawrence (1910). Outlines Of Doctrinal Theology. Saint Louis, MO: Concordia Publishing House. p. 162. Archived from the original on 21 January 2012. ^ Matthew 3:16-17, John 3:5, 1 Corinthians 11:19, Graebner, Augustus Lawrence (1910). Outlines Of Doctrinal Theology. Saint Louis, MO: Concordia Publishing House. p. 162. Archived from the original on 21 January 2012. ^ Luke 7:30, Luke 22:19-20, Graebner, Augustus Lawrence (1910). Outlines Of Doctrinal Theology. Saint Louis, MO: Concordia Publishing House. p. 162. Archived from the original on 21 January 2012. ^ Acts 21:16, Acts 2:38, Luke 3:3, Ephesians 5:26, 1 Peter 3:21, Galatians 3:26-27, Matthew 26:28, Graebner, Augustus Lawrence (1910). Outlines Of Doctrinal Theology. Saint Louis, MO: Concordia Publishing House. p. 163. Archived from the original on 21 January 2012. ^ 1 Peter 3:21, Titus 3:5, Graebner, Augustus Lawrence (1910). Outlines Of Doctrinal Theology. Saint Louis, MO: Concordia Publishing House. p. 163. Archived from the original on 21 January 2012. ^ Titus 3:5, John 3:5, Graebner, Augustus Lawrence (1910). Outlines Of Doctrinal Theology. Saint Louis, MO: Concordia Publishing House. p. 163. Archived from the original on 21 January 2012. ^ John 20:23, and Engelder, T.E.W., Popular Symbolics. St. Louis: Concordia Publishing House, 1934. pp. 112-3, Part XXVI "The Ministry", paragraph 156. ^ a b Pixton, Paul B. "Sacrament". The Encyclopedia of Mormonism. Brigham Young University. Retrieved 6 July 2014. ^ Chryssides, George D. (2012). Historical Dictionary of New Religious Movements. Rowman & Littlefield. p. 98. ISBN 9780810861947. The Community of Christ acknowledges the Book of Mormon and Doctrines and Covenants, but they do not replace the Bible, which now tends to be used exclusively during worship as the church's Scripture. Congregations roughly follow the mainstream churches' Revised Common Lectionary. From the 1960s, doctrinal reassessment took place, and the Community of Christ affirms the doctrine of the Trinity and acknowledges eight sacraments: baptism, confirmation, blessing of children, the Lord's Supper, ordination, marriage, the Evangelist Blessing, and administration to the sick. ^ "BBC: Religion and Ethics: Pentecostalism". Bbc.co.uk. 2 July 2009. Retrieved 25 November 2008. ^ The Salvation Army: Why does The Salvation Army not baptise or hold communion? Archived 30 September 2008 at the Wayback Machine. ^ Grace, Eden (11 December 2003). "Reflection on what Quakers bring to the ecumenical table". ^ M’Clintock, John; Strong, James (1885). "Clancularii". Cyclopædia of Biblical, Theological, and Ecclesiastical Literature. Supplement Vol. 1, A-CN. New York: Harper & Brothers. p. 957. OCLC 174522651. Look up sacrament in Wiktionary, the free dictionary. Herbermann, Charles, ed. (1913). "Sacraments" . Catholic Encyclopedia. New York: Robert Appleton.